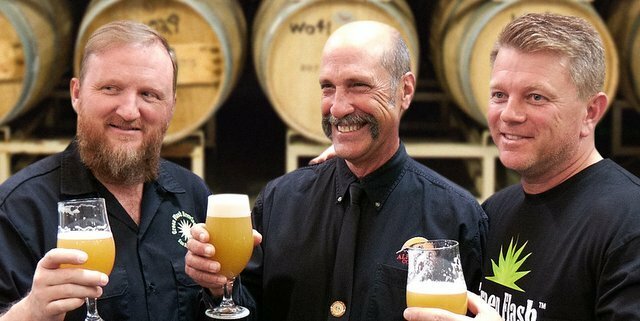 After re-watching Suds County USA, a 2012 documentary chronicling the timeline of San Diego’s craft beer explosion, Green Flash Brewing Co-Founder and CEO Mike Hinkley was again struck by the “all-hands-on-deck” spirit of craft beer’s earliest pioneers. Hinkley had recently heard that Pat McIlhenney of Alpine Beer Co. was looking for a contract brewer, so that he could make enough beer to raise capital to expand operations. Hinkley immediately called McIlhenney and offered to brew kegged beer for Alpine at Green Flash. Green Flash (right?) and Alpine (left?) came to a gentleman’s agreement to boost Alpine’s production in the spirit of the craft brewing industry. Here are the terms of the “non-contract”: Green Flash will not make a profit on the beer, only recover its costs, and only brew the beer when it does not interfere with meeting orders for Green Flash. To help matters, Green Flash is installing six new 250 barrel (bbls) fermenters this month, bringing the San Diego brewery to 100 percent production capacity, about 100,000 annual bbls. Additional production increases will come from a second brewery in Virginia Beach, Va., currently in planning. Green Flash has steadily increased production capacity ahead of demand since completing the initial build out of its state-of-the-art San Diego facility in 2011. The timing of the arrival of the new tanks fit Alpine’s timing perfectly and the price could not be beat, so the only thing left was the hand shake. Alpine Beer Co. was founded in 1999 by contracting with AleSmith Brewing Co. for its award winning McIlhenney’s Irish Red. Located in the eastern part of San Diego County, this family owned and operated brewery opened in 2002 in the little hometown of Alpine. Since that time, Alpine has offered more than 30 different brews, some barrel-aged beers, multiple IPAs and unique lagers to name a few. Green Flash is brewing only kegged beer for Alpine. Alpine is finalizing plans to work with Cold Springs in Minnesota to produce canned beer. These combined efforts will allow Alpine to produce about 5,000 bbls annually — an increase of about 200 percent. Green Flash will brew three of Alpine’s most popular offerings: Hoppy Birthday, Nelson and Duet to spec, hops and other ingredients provided by Alpine. Green Flash will be ready to brew as soon as the latest cellar expansion is complete. They will brew Alpine beers for approximately one year, brewing a rotation of 250-bbl batches of these three Alpine beers. Silva and McIlhenney will work closely with the brewing team at Green Flash to ensure these beers are brewed to spec, and White Labs will ensure each release is consistent to Alpine’s formulations with lab testing prior to distribution. Beer will be packaged in Alpine’s kegs, and Alpine will be managing its own distribution. Finalizing compliance and other necessary legalities is currently in process. While there is no set timetable in place word is that the two may be starting in September at the earliest. However, the brewers met yesterday evening over a beer to finalize next steps, sealing their agreement with a handshake and another round. Just like old times. RT @CraftBrewingBiz: Cool story: http://t.co/XL6FJgPjnr @greenflashbeer to brew beers for Alpine on ‘non-contract’ basis.